The reality TV star and mother of three shared dramatic footage of burning forests, fire and police vehicles on her Instagram account like many Californians who had to flee the fast-moving blazes. The ongoing danger has prompted the state's governor to declare a state of emergency. She concluded her reportage with an ominous skyline snap with fire and smoke blazing on the horizon. The star had to flee her house in a posh suburb of Los Angeles, Calabasas, which was hit like other areas in California, by wildfires. — thedailyteaspill (@thedailyteaspi1) 9 ноября 2018 г. ​In Southern California, residents of 1,200 homes were evacuated while several communities remain under siege because of two large blazes. Officials expect the fire to burn its way to the ocean. In Northern California, the entire population of Paradise, 27,000 people, were ordered to evacuate. The fire destroyed or damaged houses and facilities. — Mahon (@MobRahon) 8 ноября 2018 г. ​"The town is devastated, everything is destroyed. 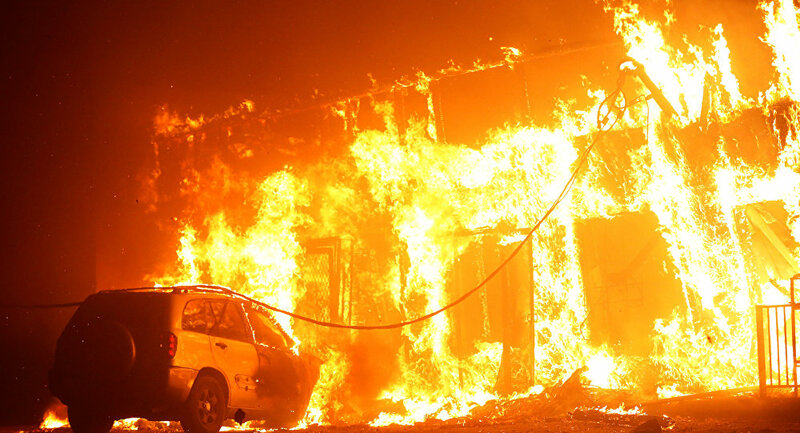 There's nothing much left standing," California Department of Forestry and Fire Protection spokesman Scott Maclean said. — Miranda Wilson (@mirandawilson43) 8 ноября 2018 г. — moe (@masonmorgann13) 8 ноября 2018 г. — wcoast777 (@wcoast777) 8 ноября 2018 г. ​In neighboring Chico, a city of about 93,000 people, residents were also ordered to flee as wildfire advanced to its outskirts. The California Highway Patrol announced Thursday afternoon that it had closed several roads in the area, including Skyway Road, which is the northerly passage out of town, and Highway 70 to the south of the fire. — Eric Kiesow (@_raining_tacos) 8 ноября 2018 г. ​​Ongoing danger prompted acting Governor Gavin Newsom to declare a state of emergency in the area and request that a federal emergency be declared. Fire officials warned of fire dangers in many areas of the state, saying low humidity and strong winds were expected to continue.